The World Cup kicks off in Russia in just over a week. But FIFA says fans of the beautiful game are being duped by ticket resellers. "Secondary ticketing" is a big business. Globally, it's estimated to bring in $8 billion a year, according to multiple news reports. That's over a quarter of the $30 billion primary ticketing market. But laws regulating online scalping remain somewhat vague. Secondary ticketing companies, such as Viagogo, allow customers to take advantage of the regulatory murkiness to resell tickets at sky-high prices. FIFA, the governing body of the World Cup, filed a criminal complaint against Viagogo Tuesday following complaints from consumers and watchdog groups about "opaque and deceptive business conduct." Soccer buffs can buy tickets for the tournament on FIFA's website, via an application process that began last September. FIFA says this is the only legitimate way to purchase tickets, and employing any other method runs a risk of tickets being voided. 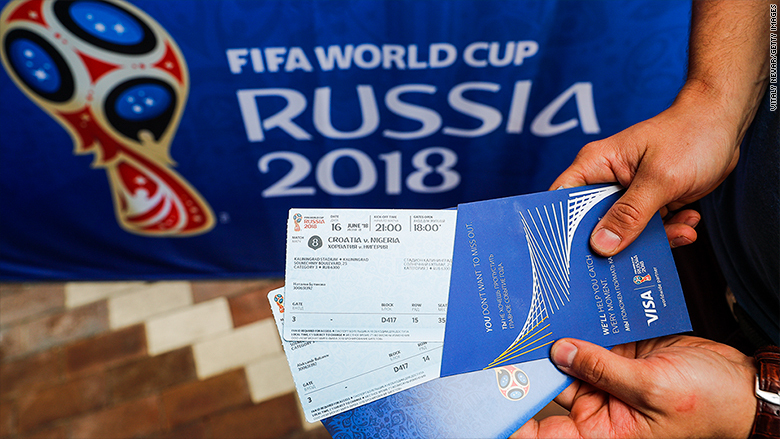 "FIFA's ultimate objective in the fight against the secondary ticket market is to prioritize the safety and security of fans and enforce a fair pricing scheme," FIFA stated in a press release following the complaint. A Hamburg court instated an initial preliminary injunction against the Swiss-based Viagogo in January, banning it from reselling World Cup tickets. The court agreed that Viagogo advertized tickets that were overpriced, and that some weren't even available at the time of sale. This is just one of the measures that FIFA is taking against fraudulent ticket sales this year. Another is that visitors must apply for a Fan ID, a photo permit required to enter stadiums. FIFA says it's a requirement from the government of Russia, where this year's tournament will be held, and it also serves as a visa waiver. FIFA has an official resale procedure. Soccer fans looking to offload tickets can do so via the official site. They'll receive a face-value refund, minus a 10% handling fee. The official ticket price for France's game against Peru on June 21 is $210, according to FIFA's pricing chart. A recent search on Viagogo showed prices as high as $1,394 for that game -- including a $284 booking fee and a $50 delivery fee, which only appear at the final stage of checkout. "This charge is what allows us to provide you with a great service," reads a note on the site. "It helps us verify your tickets are valid, ensure safe and secure delivery of your tickets in time for the event, and provide prompt customer service if you ever need it." This practice of not mentioning add-on fees -- such as service and delivery charges -- until the later stages of the booking process is known as "drip pricing." "They're not being clear on add-on fees," said Matthew Wilson, a spokesman for the Advertising Standards Authority, the UK's ad regulator. "That's not fair." Viagogo, which was set up by a Harvard graduate as a direct European rival to StubHub, has been in hot water in the United Kingdom lately for these "deceptive" practices. Last month, 10,000 tickets purchased on the site for an Ed Sheeran concert in Manchester were unauthorized, and fans were denied access to the venue. Although StubHub and Seatwave cooperated with new UK regulations requiring third-party ticket resellers to be more transparent about hidden fees and other equivocal issues, Viagogo is the only resale company that's been "unwilling and unable to comply," Wilson said. Last week, the UK Digital Minister, Margot James, advised users to stay away from Viagogo, calling it "the worst." Viagogo did not respond to multiple requests for comment. Industry experts note that ticket reselling is a competitive space, and customers who don't like high fees can usually shop elsewhere. Tickets hold a certain market value that may be above the amount listed at the box office. That's why ticket resellers advocate for their business' open market, which is far more transparent than the scalping market of the pre-internet era. The FanFair Alliance was established in 2016 to combat issues arising from online concert ticket scalping. Adam Webb, the campaign manager, explained that resale companies "were originally marketed as fan-to-fan platforms, because it was a challenge to resell a ticket." But now, the sites are swamped with professional ticket sellers. Webb said that promoters and artists are now starting to add more stringent terms and conditions to their tickets to discourage or prohibit ticket resellers from listing tickets. Webb said Viagogo is certainly the outlier in its non-compliance, but the market still has underlying problems that need to be addressed. In the United States, regulations are cloudier. Online scalping is legal in most states, though at least 30 have restrictions of some kind. President Obama signed the BOTS Act in 2016, the only recent federal piece of legislation on ticket resales. This law banned ticket bots, or "computer programs that quickly buy up the best seats so the tickets can be resold elsewhere for more money," according to the Federal Trade Commission. But it's a difficult law to enforce, and still doesn't eliminate the ability for humans to "harvest" tickets -- by using multiple identities and credit cards to buy an excessive number to then resell. It's unclear at this stage what will happen to fans who plan to travel to Russia to cheer on their home teams with Viagogo-sourced tickets, but FIFA claims it "reserves the right to refuse entry to any holder of such tickets."